Photo courtesy of Tourism Toronto. Winter is cool! And Toronto is an exciting place no matter what the season. Bundle up to enjoy the great outdoors then hunker down with a glass of something warming before taking in a big show or a thrilling game. Here are just a few of the myriad wintery activities that await, courtesy of Tourism Toronto. Cozy up for a meal or cocktail at one of the popular heated winter patios at the Drake Sky Yard, Bar Raval and the Broadview Hotel. The Winter Light Exhibition at Ontario Place is just one aspect of “Winter at Ontario Place” which includes various winter-themed activities. The festival is free to attend. Toronto Light Fest artfully illuminates the Distillery Historic District and features works by Canadian and international light artists across 45 days and 44 different locations. Celebrate winter in the heart of the city at Bloor-Yorkville’s Annual Icefest! A showcase of incredible ice sculptures and live ice-carving demonstrations for the entire family to enjoy. Enlivening the Toronto waterfront, Ice Breakers is a series of large installations along the stretch of lakeside west of Yonge Street. Winter Stations is an award-winning, annual international design competition and exhibition of temporary public art installations affixed to the lifeguard stands along Ashbridges Bay, east to Balmy Beach. Seven inspired designs from the U.S., Germany, UK, the Netherlands and Canada contribute to the theme of Migration. When the weather gets chilly it’s time to fuel up and Toronto has some of the tastiest fuel going. The mac daddy of food events is Winterlicious (January to February 2019), the perfect opportunity to indulge in creative cuisine from around the world at great prix fixe value. Turn your tour into a moveable feast with a number of delicious and thirst-quenching excursions. These unique (and customizable) guided tours offer history, hidden secret spots plus lots of warm cozy breaks for delicious local specialties. Grab major league tickets to a Raptors or Maple Leafs game at Scotiabank Arena (formerly Air Canada Centre). Or get pumped up alongside hundreds of Toronto sports fans in Maple Leaf Square, the outdoor public square where games are broadcast live on the 80- x 50-foot screen. For exciting pro hockey played in more intimate settings check out the Mississauga Steelheads, Brampton Beast or Toronto Marlies. Lovers of craft beer are invited to sample more than 150 beers crafted from brewers across Ontario and Quebec. In a warm and festive setting, discover a wide range of local craft breweries and nibble on delicious gourmet food from Toronto’s best food trucks. Take a cycling tour and gain a deeper appreciation for Toronto and the Toronto Islands. Only a quick 10-minute ferry ride from downtown Toronto, a visit to the Toronto Islands makes for a great winter excursion, especially if you love outdoor activities. It is a uniquely peaceful destination in the winter, just a stone’s throw from the downtown core. Outdoor enthusiasts will love it in the winter when they can partake in a number of activities usually only available outside of the city from cross country skiing to snowshoeing. Your favorite Disney characters and stories are brought to life with the artistry of ice skating to create an unforgettable family experience as Disney on Ice presents Reach for the Stars. 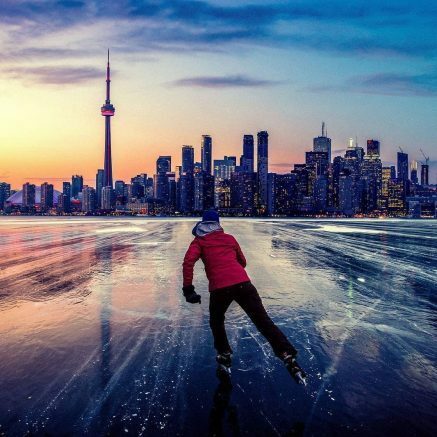 Explore the popular Nathan Phillips Square (featuring the Toronto Sign) and Harbourfront Skating Rinks or the newly opened Bentway Project Skating Trail. The Bentway is a unique and innovative public space that transforms 1.75 km underneath Toronto’s Gardiner Expressway into a new gathering place. The initial phase – from Strachan Avenue to Bathurst Street – knits together seven local neighborhoods with over 70,000 residents, becoming a gateway to the waterfront, while providing access to important attractions and destinations – from Fort York National Historic Site, Ontario Place and Exhibition Place to Harbourfront Centre and the CN Tower. The Bentway offers year-round activities and events, including gardens, a skate trail, recreational amenities, public markets, public art, special exhibitions, festivals, theatre and musical performances, and more. They also offer skating at Evergreen Brickworks starting in January 2019. Harbourfront’s DJ Skate Nights are around the corner, meaning you can glide into winter with the smooth sounds of disco, hip-hop and techno at Harbourfront Centre’s waterfront Natrel Rink. The weekly DJ Skate Nights will kick off with the official launch on Dec. 15 for the nighttime winter party on ice. The series runs for 10 weeks every Saturday from 8 until 11 p.m., ending on Feb. 16, 2019. The best part about this weekly series is that it’s totally free. COMING 2019 – Canada’s Wonderland WinterFest: Canada’s Wonderland will be magically transformed into a winter Wonderland full of enchantment and holiday cheer! Be the first to comment on "Make nearby Toronto your winter getaway destination "